A while back Tim wrote a post on some surfboard ding repair products that I feel do an amazing job at fixing your surfboard between each session. These are products that you can literally put on your board and have a watertight fix in a matter of minutes, something all quick fix kits should have by now. Another thing all of these kits come with is sandpaper or some type of sanding pad. This is used to sand away and smooth out any rough or irregular edges that might have occurred during your ding repair. Surfboard ding repair is something that comes with the sport. If you surf then you’re going to repair a ding or two sometime in your life. Good thing we’ve come out with some great easy to use products so everyone can have a go at ding repair. Session Saver, another quick fix available to the public, is a perfect example of the advancements that are being made everyday in providing a more consumer friendly ding repair kit. Session Saver comes in an easy to open pocket size container that is perfect for throwing in the glove box of your car or in your board bag for your next surf trip. One big plus of this product is that it is completely mess free. Session Saver is not like other quick fix products that deal with sticky resin that dries on your hands or permanently cures the cap to the container. Instead it uses dark putty that you simply knead with your hands until it turns white. Once the putty is ready you simply smooth it over the ding with wet fingers until you have the desired shape and texture to hide the ding and avoid any form of sanding whatsoever. So it’s basically a ding repair product that has worked out all of the kinks, no mess and no sanding. Some other pretty awesome features that this product has that other ding repair kits lack is the ability to easily reshape and rebuild noses, tails and rails. The thick putty allows you to mold and shape the part of your board that was lost without having to deal with drippy thin resin running all over your board. If you have ever used other ding repair kits to fix a chunk out of a board you know what I’m talking about. The greatest feature I think this product has to offer, and the reason I would call it the “Quickest Quick Fix” is it’s ability to cure underwater. They call it the Amphibian Curing Technology. 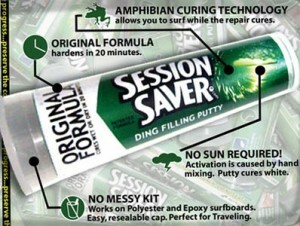 This product takes about 20 minutes to fully cure but once it’s on your board, and just how you want it, you can hop right back in the water and let those 20 minutes happen while you’re still out enjoying your session. If that’s not the future of quick fix I don’t know what is. This product has recently been featured in Surfing Magazine and is currently making its way to surf shops around the globe and is definitely something to look out for. You can also buy it online for a very generous price of about seven dollars. Find out more at sessionsaver.com.